This unique compendium, made by Johann Anton Linden for Christopher Leibfried of Wurzburg is an extraordinarily skilful instrument. The various gilt and silvered brass components are finely engraved. 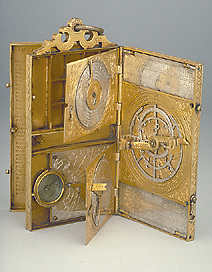 It contains numerous types of dials and time telling devices, a table for holy days, compartments for keeping drawing instruments, a table of latitudes, a table for converting time in different systems of hours, a table of stellar positions, as well as an astrolabe.